In the story of Bambi, Thumper said, "If you can't say something nice, don't say anything at all." Sorry, Thumper. I tried very hard to see this effort as a good thing for all service clubs because it encourages collaboration and is an effort to raise awareness of the impact such organizations have on the communities they serve. Next, I tried to ignore it because my opinion is just my opinion and in the grand scheme of things, it matters very little. However, I would not be true to myself or my efforts of helping raise the awareness and relevance of Optimist Clubs if I let the International Week of Service slip by without commenting that it is not the best idea to come out of the international office. 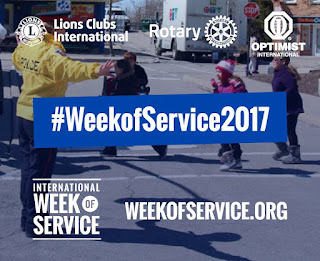 The International Week of Service is a program of Lions Clubs International. With staff-level coordination and acceptance, the Lions invited other service organizations, Optimist International, Rotary International, Sertoma, Kiwanis, Soroptimist, and others, to participate and many accepted. 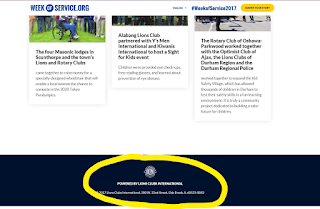 Lions Clubs International developed a website and a Facebook page and included links for individuals to get involved. It also included a link for participating organizations to submit their story of service. Sounds simple, innocent and perhaps even benevolent, doesn't it? But here is the rub: Optimist International already has an activity that is similar. Optimists in Action was designed for Optimist Clubs to engage others, non-members, other organizations and service clubs, in a joint activity on one day, any day in May. Why is this activity not the one being promoted? 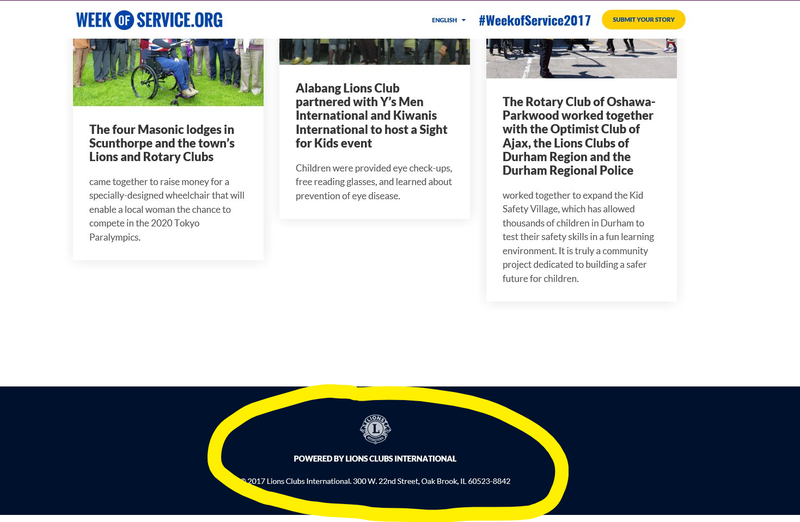 Here is the concern: Lions Clubs International, the largest service organization of all, has been given carte blanche to interact at a club level as it collects not only stories of the community service efforts, but also the contact information of the most active members in all brands of service clubs around the world. Okay, some might think I sound paranoid, but it sounds like a potential membership recruitment strategy to me. Why would we ever want to give our stories or our valued members away? As I have stated many times on this website and other forums, Optimist International must develop an integrated marketing communications strategy and it should hire a professional to do it right. 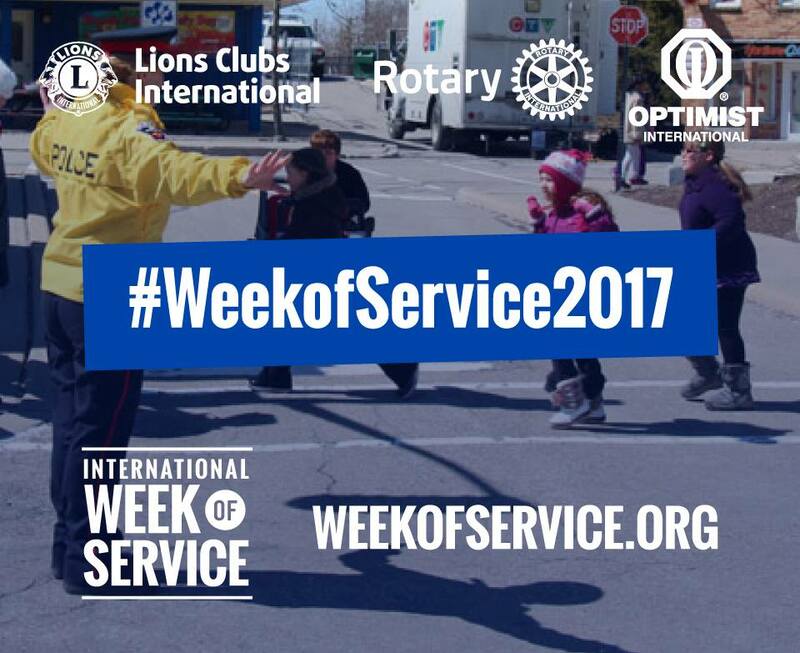 Service organizations like Lions, Rotary and Kiwanis have already done this. Organizations with more professional images will not suffer from this potential membership grab that I fear is in the making, and we can be fairly assured that long-time members passionate to the mission of Optimist International won't be tempted to jump ship. However, those newer members, the ones who are more accustomed to robust online relationships, may find it more interesting to volunteer with an organization that "gets it." I'm not really tempted to move on; but sometimes, when I see efforts like this one, I wonder, doesn't Optimist International understand what Optimist Clubs do every day? Every day, Optimist Clubs reach out to their communities - other service clubs included - to make a difference. Why? Because, together they can. Holidays, real and imagined, bring Optimist Club members out to party. Sometimes it's with children, like Christmas, and sometimes it's an adults-only activity, like St. Patrick's Day. In Idaho, two Optimist Clubs are fundraising on this day of wearing o'the green. In McCall, Idaho, there will be a bingo game with cash prizes. "Do you feel lucky?" the Optimist Club asks. Dress up in green and lucky players might win a special prize in addition to their potential bingo winnings! 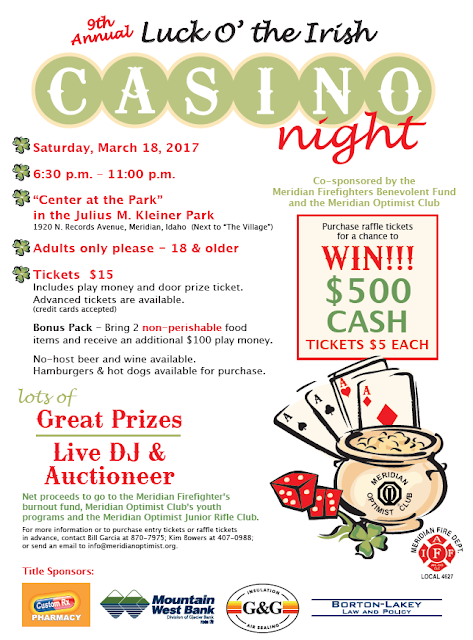 In Meridian, Idaho, the Optimist Club will host its Luck o'the Irish Casino Night. No cash prizes are available at this one, but there is plenty of fun in the casino-style game night, plus door prizes and raffle items to boot. The Meridian Fire District Drum and Bugle Pipes and Drum Corps are partners in this 9th annual event. These events have more in common than their green themes. Both are good examples of how the Optimist Club raises money and sparks fellowship at the same time. Optimist Club members will tell you that putting on a program or carrying out a project builds a team spirit and helps our members get to know one another better. Club membership - fellowship - leads not only to good deeds for the community; it leads to friendship for all. 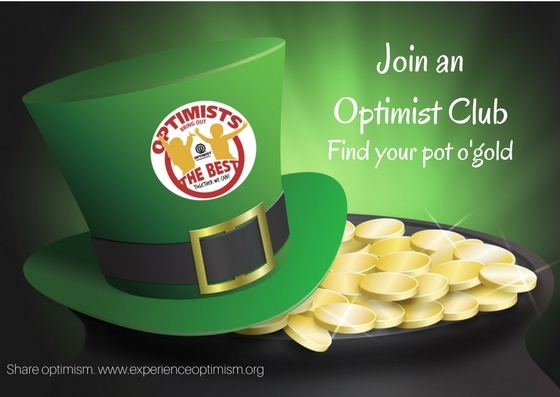 Join an Optimist Club and you'll find that pot of gold known as friendship. Click here to find an Optimist Club near you. If you would like to start a new Optimist Club, click here and I'll lend you a hand. Or, click here to be a Friend of Optimists. Women are making progress. We are making headlines for our feminism and no, I don't mean that we are being memorialized for glamour and compassion. According to the Merriam-Webster dictionary, feminism is the belief that men and women should have equal rights and opportunities. Women, and sometimes men, are taking part in organized activity in support of women's rights and interests. We are making our voices heard in pursuit of equality. We shouldn't have to march for these rights; however, sometimes the best way to bring immediate attention to anything is to make a big noise and even then, the going is slow. But progress is progress, no matter the pace; we must keep moving forward. We must #BeBoldForChange. Thank you to the women who who have come before me. Thank you to those who are fighting the good fight today and will continue to do so tomorrow. I send my respect to all in honor of International Women's Day 2017.